“Say NO to Corruption” campaign poster signed by the world’s fastest man, Usain Bolt. Contractor General, Dirk Harrison, talks to Jamaican students about corruption and how it can negatively affect their future. Youth panel participants present examples of corruption and the negative consequences it has on Jamaican society. 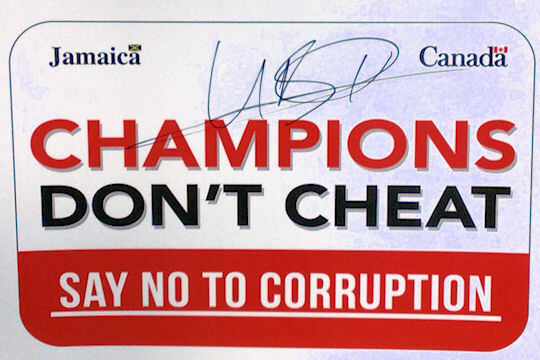 Jamaica’s public anti-corruption campaign highlights student-designed poster. This was just one of the events that the Canadian High Commission in Jamaica supported in 2015 in partnership with national organizations in a campaign to increase awareness and encourage youth involvement in efforts to fight corruption. "Non-participation is not an option; we must stand against corruption! "exclaimed Jamaica's Contractor General, Dirk Harrison, to students at the #YouthAgainstCorruption event at Edith Dalton James High School in Kingston, Jamaica on December 10 - the International Day Against Corruption. No country is entirely free of corruption. However, if corruption is deep enough it can hinder economic growth and good governance, and decay the fabric of society. The High Commission supported Jamaica’s Office of the Contractor General to hold their first conference on corruption in government. The conference featured a half day of activities for youth, including a presentation by the Jamaican Youth Theatre which dramatized acts of corruptionthat take place in everyday life. In partnership with Jamaica’s Office of the Minister of Sport, the High Commission ran the campaign "Champions don't cheat - say no to corruption" at the Boys and Girls Track and Field Championships - one of the largest high school level athletics event in the world. The world’s fastest man and woman, Jamaica’s Usain Bolt and Shelly-Ann Fraser Price endorsed the theme of the campaign. 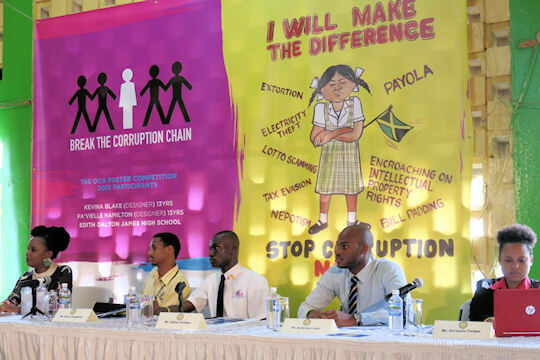 Youth from across Jamaica entered into an anti-corruption essay and poster contest that highlighting both the ways in which corruption can manifest in everyday life and the negative effects it has on society. The High Commission was pleased to participate in the awards ceremony. The winning poster submissions were featured during the Canadian Regional Education Fair in Kingston and Montego Bay. The fair gave Jamaican students from more than 40 high schools across the country an opportunity to meet with the Contractor General. At the fair, students discussed corruption and were encouraged get involved in anti-corruption efforts in their communities. To mark International Day against Corruption, the winning poster was also included in a public advocacy campaign coordinated by the High Commission and the Contractor General. 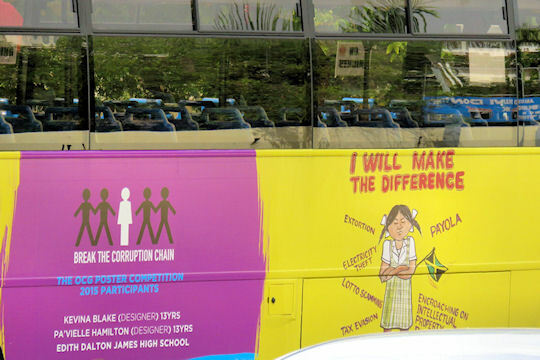 The design and anti-corruption message was included on billboards and public transport in both Kingston and Montego Bay. Canada strongly supports international efforts to combat corruption. The fight to stop corruption is a long one, but worth the effort.